Posted on October 28, 2012 by Alison V.
I was somewhat of a social butterfly this weekend, which is unusual for me. If I go out more than one night during the weekend then it’s a busy weekend for me. It made me stop and think about my friends, my military and civilian friends, and just friendship in general. I’ve never been one of those girls to have tons of friends, I like to have one or two really good friends, and that’s it. I don’t need to win a popularity contest. When I moved down to San Diego for college I made friends, they were girls that lived in my dorm and went to college with me. We would go out on the weekends and party or just hang out. But then I went and got married at 20, and started to realize that I wasn’t connecting as much with my college friends. I was a married woman living with my husband, I didn’t want to party anymore. So I started looking for married friends, which turned out to be military wives. Now, I could have a whole post about military wives, they are a crazy bunch of people, but let’s just say that I did eventually find some that I clicked with, and I ended up having more military friends then I did civilian friends. When I started graduate school I wasn’t really looking to make tons of friends, I had a pretty set group that I was hanging out with, and Jeremy and I were always doing things on the weekend. But I did make some friends, and when Jeremy deployed this summer we got a lot closer. Now I have a group of girls that I hang out with at least once a weekend. So, getting back to this current weekend. I went out with a fellow military wife for lunch on Friday, then out with my civilian friends that night. On Saturday I went to a Halloween party hosted by my military friends, then on Sunday watched football with another military wife. I noticed that when I’m with fellow military wives, we talk about our husbands and the military a lot. It’s what we have in common. And I love being able to talk about deployment and duty stations and all the trial and tribulations that come with being married to the military, without having to explain everything. They get it. But when I’m with my civilian friends, I love that fact that I only talk about me. I’m not Alison, military wife. I’m Alison, student, social worker, country music fanatic, etc. Jeremy almost never comes up in conversation. I talk about school and my work and my clients. Its awesome. So I guess my conclusion is that I like having both civilian and military friends. I like the balance. Having friends outside the military has also made me realize that it’s important to have friends for myself. When Jeremy is home we typically hang out with people in groups, he knows the guys from work, and I know the wives. But with my civilian friends, I go out with them alone, Jeremy stays home. And I like that separation, having something that is just mine. Him being gone has really opened my eyes to the fact that I LIKE girls nights. I LIKE going out without him sometimes. I think it’s healthy in a relationship, and I plan on keeping it up after he comes home. And to close on a completely different topic. Here is a picture of my Halloween costume. 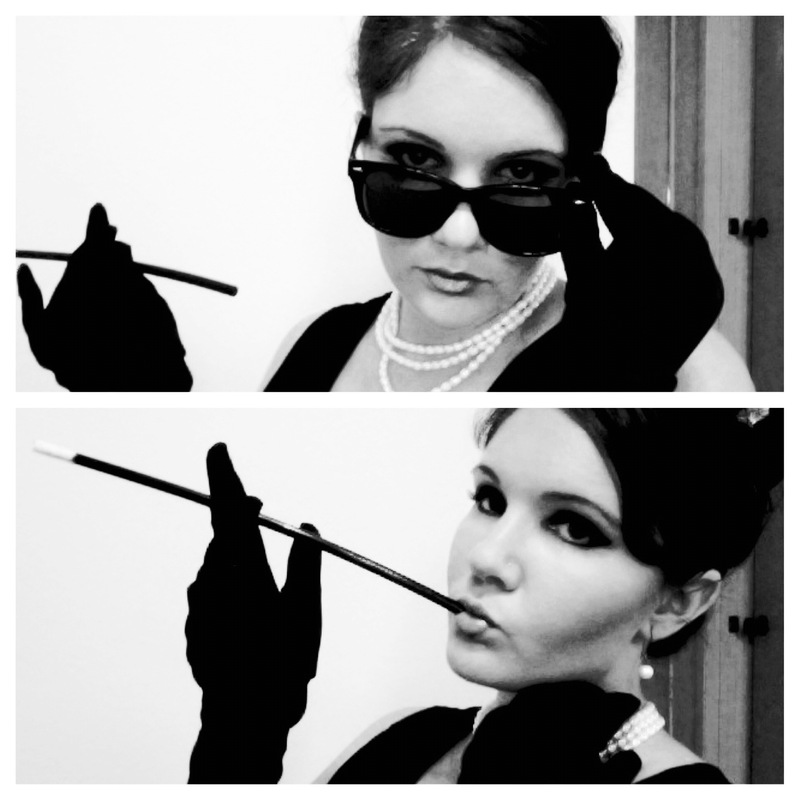 I just had to share because I am super proud of how it came out 🙂 Breakfast at Tiffany’s! I just love having girl friends! I have a balance of both as well, but just having girl time to me is even more important, just as much as dude time for him. Don’t get me wrong, love the man, he’s my best friend, but sometimes we both need some space. I think we struggled as a couple when we just had one group of shared friends at our last duty station, so I’m glad to have met all sorts of great people to hang out with!